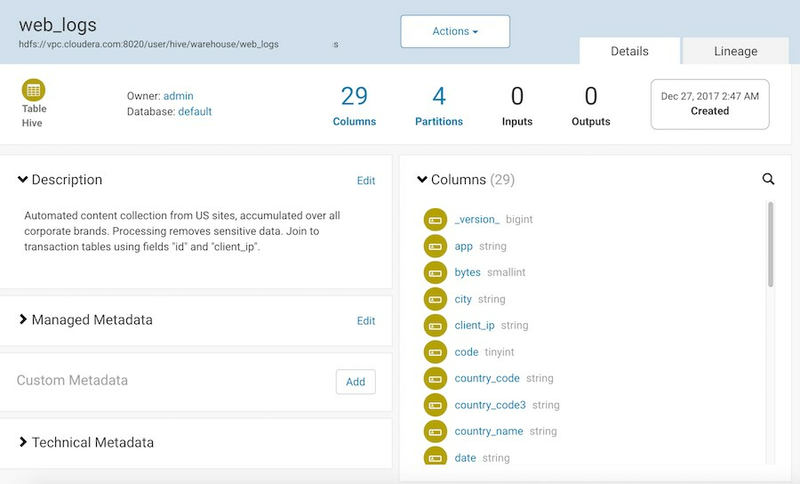 When you enter search terms in Cloudera Navigator, you are looking up names, types, descriptions and other metadata collected by Navigator Metadata Server. The search index includes metadata (not data) about your cluster data assets and operations. You can make the search more powerful by associating your own information (business metadata) to the entities that Navigator stores. Tip: Search data does not overlap with audit data. To access audit events, use the Audit tab in the Navigator Console. You can find entities matching selected criteria using the Cloudera Navigator console, as detailed below. 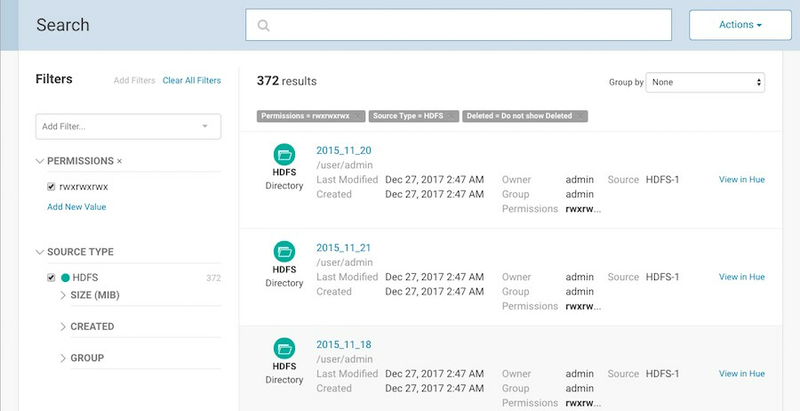 Log in to the Cloudera Navigator console using the credentials assigned by your administrator. The Cloudera Navigator console opens to the Search tab. To display all entity types in the search results, click Clear all filters. Or, limit search results to specific source types, entity types, or other characteristics by applying filters. Enter the search strings in the Search box. The following filter example demonstrates how to narrow search results by selecting a built-in Source Type filter set to HDFS and the technical property PERMISSIONS with the value rwxrwxrwx. Breadcrumbs for each filter value show above the results. The "Deleted = Do not show Deleted" breadcrumb is included in the filter by default. When you select a property value, a filter breadcrumb shows above the search results. Click the "x" in the breadcrumb to remove that criteria from the filter. All entity types can display inputs and outputs. See Enabling Inputs and Outputs to Display. If managed properties have been defined for a particular entity type, the Show All checkbox in the Managed Properties pane displays all properties that can be assigned values for the selected entity. To display only those properties that have values, clear the checkbox. If all properties have values, the checkbox has no effect. In the search results, click an entity name link. 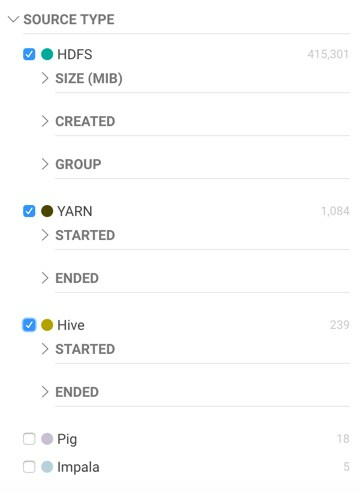 The Details tab displays. The caret > indicates fields with content; click to expand them. In addition to managed properties, user-defined properties, and technical metadata, you can view the names of the columns and the inputs and outputs. The following account table entity has two managed properties in the realestate namespace: Department and AccessAttempts. To filter search results, choose filter values in the Filters pane or type search strings in the Search box. The Filters pane lists default properties (source type, type, owner, cluster, and tags) and their values. You can add or remove properties from this list: click Add Filters... and choose from the defined technical and metadata properties. To remove non-default filter properties, click the x in the filter. Note that when filter values are timestamps, the server stores the timestamp in UTC, and the UI displays the timestamp converted to the local timezone. Facet values with the count 0 are not displayed. Typing "sample_*" in the originalName property returns only entities whose names match that exact string. To perform a wildcard search, type the wildcard string in the Search box. For example, typing the string "sample_*" in the Search box returns all entities with "sample_" at the beginning of their original name. Using the Group by option, you can organize the search results into groups based on the common properties of the entities in your search, including managed, user-defined, and some technical metadata. When you choose a group by property, the search panel lists the property values and shows how many search results correspond to that value. Click the number for a group to show the search results for that group. Click the "x" on the Group by breadcrumb to remove the groupings. 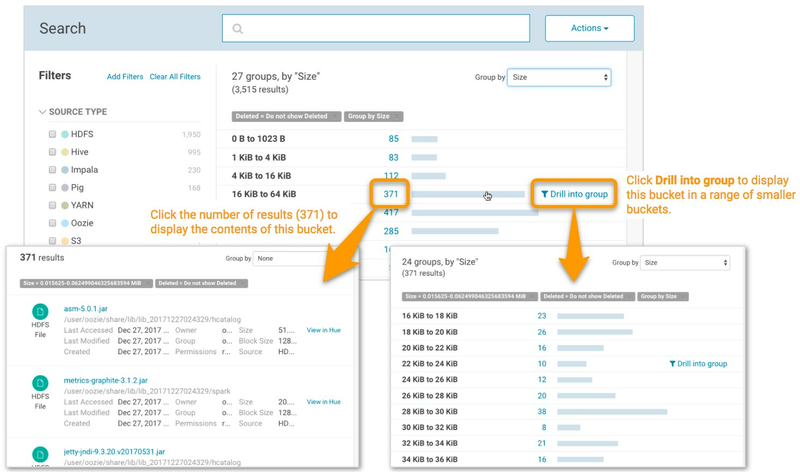 When you group results by a numeric or date property, you can also choose to "drill down" into a single group: the results from that group are grouped into smaller buckets. Hover over the group row to show the Drill into group control. The Group by view shows at most 50 values of a property. To the right of the Search box, select Actions > View saved searches.... A label with the saved search name is added under the Search box. Click the saved search name. The breadcrumbs and full query if displayed are updated to reflect the saved search, and the search results are refreshed immediately.